If you are a fan of Crazy Couponing, you know how much I love smartphone apps that help you save or make money! Belvita Soft Baked Breakfast Biscuits 8.8 oz. The Purex Laundry Help app has been released! I immediately downloaded it and got to exploring. I’ve done so much laundry in my lifetime that I thought I was an expert, but apparently not! If you’re like me, you HATE ironing dress shirts. For some reason, I could never figure out how to iron them correctly. The Purex Laundry Help app fixes that by giving step by step instructions and illustrations on how to do so! Ironing and Folding is easy Now I know what I’ve been doing wrong! Another great feature of the app is the Stain Guide. Line up the category, the type of stain with the material. Want to know how to get Baby Poop out of silk? The Purex Laundry Help App can tell you how to get it looking new again! 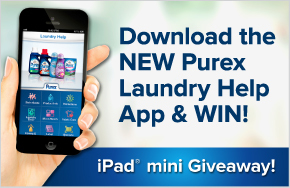 To celebrate the new Purex Laundry Help App, Purex is giving you a chance to win an iPad mini. Download the app and enter today for your chance at the grand prize! Be one of three winners!!! !